John Isner is glad he gave Newport's grass courts another chance. Now he can look back and joke about how he disliked playing on them. The two-time defending champ is making another Newport run, advancing to the quarterfinal round of the Hall of Fame Tennis Championships on Wednesday by beating Adrian Mannarino of France 6-0, 7-6 (7). ''It's funny, because when I was first professional, I played here a few times and didn't like it too much,'' he said, smiling. ''I remember one year I didn't play because I didn't want to come. Two years ago, I took a wild card here, and everything changed. 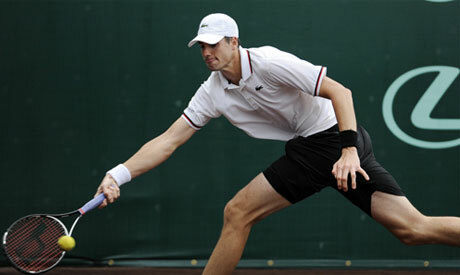 The 6-foot-9 Isner served 13 aces in the match that lasted just 59 minutes. The 28-year old Isner rode his big serve in winning his 12th straight match in Newport, improving his record to 11-0 in tiebreakers during the run. The No. 2 seeded Isner needed only 15 minutes to win the opening set, and served four aces in the second-set tiebreak. He closed it out when Mannarino hit a forehand wide off a 131 mph serve. That came one point after Mannarino double-faulted. Isner knew the match was then in his control. It was a Wimbledon rematch for the pair. Isner retired in the third game of the previous match last month after injuring his left knee. In other second-round play, No. 4 seed Lleyton Hewitt, a runner-up last year in Newport, needed just over an hour to defeat wild-card entrant Prakash Amritraj of India 6-2, 6-1. The 32-year old Hewitt was one of five players in their 30s to reach the quarters, the most in the 37-year history of the tournament. In other action, third-seeded Igor Sijsling of The Netherlands beat Yuichi Sugita of Japan 6-4, 1-6, 6-3; Michal Przysiezny of Poland ousted No. 8 seed Rajeev Ram of the United States 2-6, 7-5, 6-3; Michael Russell defeated fellow American Alex Kuznetsov 6-3, 6-4. Ivo Karlovic of Croatia beat Canadian Vasek Pospisil 6-4, 1-6, 6-3, and qualifier Jan Hernych of the Czech Republic edged American Jack Sock 6-3, 4-6, 6-4. In the last match of the day, 31-year old Nicolas Mahut of France beat American Tim Smyczek, who upset top-seeded Sam Querrey on Tuesday, 6-2, 6-4. Mahut was the Newport runner-up in 2007.